English translation of “Anarquismo Social e Organização”, by the Anarchist Federation of Rio de Janeiro (Federação Anarquista do Rio de Janeiro – FARJ), Brazil, approved at the 1st FARJ Congress, held on 30th and 31st of August 2008. The first Congress of the FARJ was held with the principal objective of deepening our reflections on the question of organisation and formalising them into a programme. This debate has been happening within our organisation since 2003. We have produced theoretical materials, established our thinking, learned from the successes and mistakes of our political practice it was becoming increasingly necessary to further the debate and to formalise it, spreading this knowledge both internally and externally. The document “Social Anarchism and Organisation” formalises our positions after all these reflections. 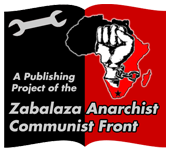 More than a purely theoretical document, it reflects the conclusions realised after five years of practical application of anarchism in the social struggles of our people. The document is divided into 16 parts. It has already been published in Portuguese in a book co-published between Faísca and the FARJ.